Hundreds of Russian civil society organizations will not receive foreign grants anymore, despite the fact they depend on such funding to survive. Some organizations have decided to try to focus on Russian funding. 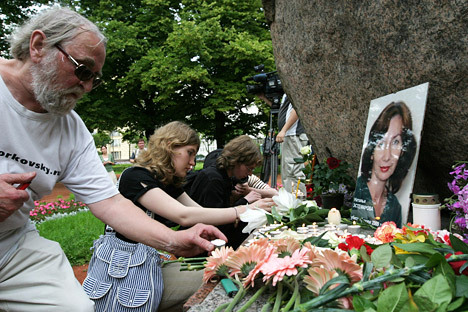 On a recent weekend a crowd of civic activists gathered for a picnic in a Moscow park to pay a tribute to their murdered friend and colleague, Natalya Estemirova, once one of Russia’s most fearless and hard-working human rights defenders. Three years ago, on another summer day, Estemirova, 51, was abducted outside of her home in Chechnya, driven to the border with neighboring Ingushetia, and summarily executed. Still, her killers have not been found. Today, Estemirova’s work continues but her colleagues fear that the new law passed last month could halt human rights monitoring in Russia. The law requires any non-governmental organization that receives foreign funding and “intending to participate in political activity” to re-register as an entity “carrying out the functions of a foreign agent.” Any NGO that fails to meet the law’s requirement could be banned. At the recent picnic, most activists said their groups accept foreign funding. They fear that the effort to label them foreign agents is intended to demonize some groups as espionage fronts. They wondered out loud if the re-registration process would be used to shut down others. Hundreds of Russian civil society organizations receive foreign grants, and some depend on such funding to survive. Yelena Denisenko, a quiet woman with a shy smile, is a human rights defender working for Memorial human rights center in Makhachkala, the capital of Dagestan, where 824 people were killed in Russia’s little known conflict in the past year. Denisenko said the new law undermined the whole idea of an independent civil society, especially in a place of heightened tension like Makhachkala, where mothers and wives of Muslims who have disappeared come to her office day and night. “I see my role in helping people find justice, in building the bridge between the suffering ones and authorities, so the desperate victims would not run to the woods to join the insurgency,” Denisenko said. Activists said that the law will force activists to be labeled as “foreign agents.” These “agents” would include advocates as varied as those pressing for greater access for people with disabilities, advocates for those who have HIV, and legal reformers. United Russia party member and Duma deputy Robert Shlegel, a supporter of the new law, said that the law for NGOs was originally directed against organizations funded by the U.S. government, such as election-monitoring groups. “It is more against groups like Golos; those NGOs who promote humane values and not involved in real politics should not worry – the law is alive and flexible material,” Shlegel said. Some organizations have decided to try to focus on Russian funding. One of the oldest Russian NGOs, the "Union of the Committees of Soldiers' Mothers," defends the rights of everyday soldiers drafted into the Russian military. The founder, Valentina Melnikova, said her group is fighting for its existence and is afraid of losing the office it has rented for 24 years. “We ran out of grants, we barely survive on two small European grants; all our attempts to apply for Russian Public Chamber grants failed. No one in Russia will give us money, as Putin does not like us, he believes that human rights defenders are his enemies,” Melnikova said. Marina Pisklakova-Parker is a sociologist who runs an organization, the National Center for the Prevention of Violence (ANNA,) that supports and defends the victims of domestic violence and lobbies for new legislation. For the first three years, Pisklakova-Parker’s “ANNA” NGO lived on a shoe-string budget. Yet it provided help to around 60 victims of domestic violence a month. However the group’s efforts to lobby for a law against domestic violence in Russia have failed. The group's fight for this legislation makes them more vulnerable under the new law. The assistance of international charities and grants has allowed “ANNA” to build awareness and now help 700 victims a month in a country where every third woman suffers from domestic violence. “I am concerned about the new law that is threatening to despoil our group’s reputation in the public eye,” Pisklakova – Parker said. After a long staff meeting last month, Oleg Orlov, the director of Memorial human rights center, decided the NGO would cease funding from the European Commission, Soros and other foreign funding. But Memorial, an organization founded by Sakharov and other Soviet dissidents in 1989, would not define its activities as political. “We are not agitating for political parties, not campaigning for any candidates at elections – we defend human rights. Those who think of us as the people’s enemies are trying to scare people away from us,” Orlov said.